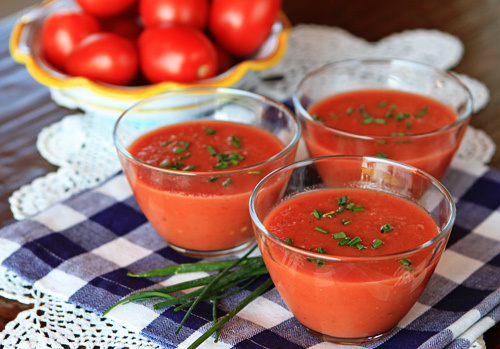 I am not usually a big fan of cold soups, but when I heard about a gazpacho made with both tomatoes and watermelon I knew I had to give it a try. This soup is both sweet and savory and is wonderful served cold at the beginning of the meal on a hot summer day. Because I was worried the soup might end up too timid in flavor, I added one small hot red chili pepper and I really enjoyed that little addition of heat. If you are not a chili fan, feel free to leave the pepper out. This soup actually improves in flavor if left overnight in the refrigerator as the flavor seem to meld and develop which makes the soup a grea option for summer entertaining. This light summer soup is both sweet and savory. Put the melon, tomatoes, onion, chili pepper, and basil into a blender and pulse until smooth. Add the lemon juice and olive oil and season with salt and pepper. Pulse to blend, taste, and adjust lemon and seasonings as needed. Serve cold in individual bowls or cups garnished with chopped chives.